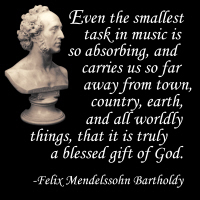 Composer Felix Mendelssohn reflects his unique insight into a very spiritual aspect of music and music-making. Now you can own this quote (or gift it to your favorite musician, music minister, choir director or church organist) on many wonderful apparel and giftware options, as seen below! Buy it now on a t-shirt, hoodie, mug, tote bag or other quality giftware or apparel item. Choose something for your music teacher or favorite student, exclusively from GearGems! Lovers of Mendelssohn should also not miss this great portrait design as well!